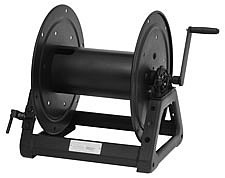 The CWR-500 reels are heavy duty for storage of most standard broadcast cables. 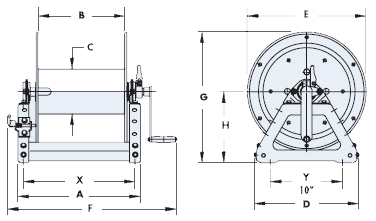 Standard 1" x 1 3/4" opening in the reel is provided for insertion of the cable to initiate winding. A pin lock is standard on manual rewind models. Divider disks are also available, and can be placed at almost any point on the drum. Can be ordered with chain and sprocket rewind, powered by either 12v DC, 110/120V single phase, or compressed air motors. 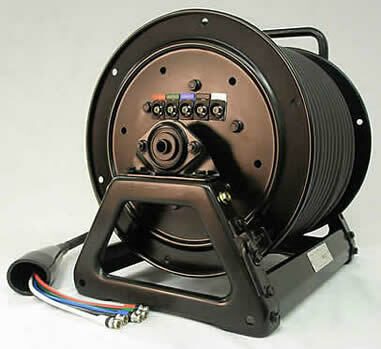 If specified, Clark can load connectors on the reel and provide a ready to go cable assembly/reel combination. to the reel with color coding and a protective vinyl boot.